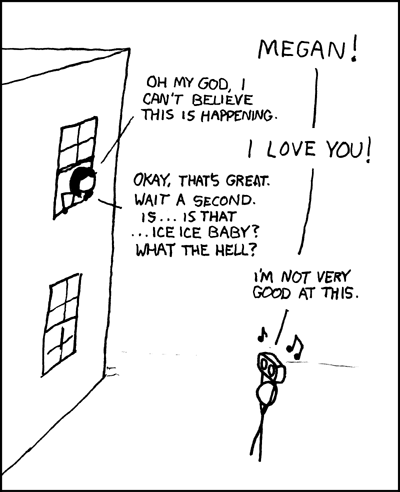 [[A woman is looking out a second story window at a guy holding a boombox over his head.]] Man: MEGAN! Woman: Oh my god, I can't believe this is happening. Man: I LOVE YOU! Woman: Okay, that's great. Wait a second. Is ... is that ... Ice Ice Baby? What the hell? Man: I'm not very good at this. <<Musical Notes>> alt-text: And she's gonna feel like a jerk when she realizes it was actually Under Pressure.